Teacher Planners – who needs them? 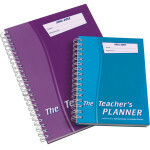 I’m always amazed at how many teachers insist on using the ‘Teacher Planner’. For those of you unfamiliar with this exciting sounding publication, it is a (thick) book that contains pages for teachers to: keep registers and results of pupils, plan lessons, draw seating plans and make a note of anything else. For as long as I can remember these planners were a staple for every teacher in every school. No matter where you worked, you were automatically supplied with one. I’m just amazed that they are still so ubiquitously sighted in schools today. In an age where most information contained in them is held electronically, why bother using them at all? I have a solution. You have to manually write in the date, day and lessons into the planner yourself, a very time consuming task. A diary with no dates in it? ‘Chocolate teapot’ springs to mind. What happens if you lose the planner? There’s no backup so once it’s gone, it’s gone. There is no logical or chronological space for teachers to write in any lunchtime activities. You have to manually write in all of your lesson plans. If your timetable is changed or a lesson cancelled, there’s no way to copy/paste any data to another page. You have to write it all out again. There is insufficient space to write in the complex daily routines of teachers. There’s no obvious place to highlight the multitude of meetings, parent evenings, pub visits, detentions, training sessions etc. into each page. They are expensive. OK, not individually as at around £8.00 per planner they seem fairly priced, but once you multiply that amount that by the number of your staff that’s a lot of cash that should be spent elsewhere. 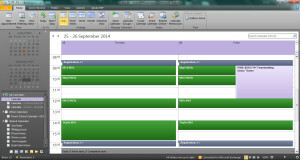 Most schools have their timetable stored in an MIS (Management Information System) such as PASS, SIMS or WCBS. Staff timetables can be exported and then imported into Outlook. You’ll need the help of your IT team to get this exported data but once it’s held in a .csv file (again, your IT team can help you with this) it can easily be imported into Outlook. I’ve put some instructions at the bottom of this blog post on how to import the .csv file (click here to jump to those instructions). I love colour coding. I have my Outlook timetable set up so that all of my lessons are clearly colour coded. Dark green means that I have yet to complete the planning for that lesson. Once the planning is complete I can easily change the colour from dark green to a unique colour for that class e.g. 7T is red, 9Y is blue etc, so that I can rest happily knowing that I’ve done everything I can for that lesson. Colour coding also helps me quickly identify lessons/classes when I’m go trawling back through my calendar at a later date (mission impossible when using the teacher planner). I share my Outlook calendar with any of my colleagues who ask – there’s nothing I have to hide. It means that meetings can be set up quickly and effortlessly as others can see when I am available. If you prefer not to show the content of your calendar (and you may have good reasons not to e.g. Child Protection or Senior Management) you can opt to share your calendar but the only details that appear to others are of when you are busy and not why you are busy. Additionally, if I’ve got a personal one-off meeting that I don’t want others to know about I can click the ‘private’ button. If I do this, those who have access to my diary will see that I am unavailable but they will see my appointment listed as ‘private’ rather than detailing what I am up to. If you have a smartphone you can have a live link to your calendar. If you’re out and about and you want to add something into your calendar, add it on your smartphone and it appears in your Outlook calendar. Nice. You can type into Outlook the details of what you are covering in the lesson or you can copy/paste from another program if you’ve already got department lesson plans available elsewhere. Either way, there’s plenty of space to write exactly what you are covering in a lesson and in an easy to follow, chronological order if necessary. You’ll already be familiar with the concept of attaching documents to emails, you can also attach documents to your lessons in Outlook. If you plan to show an image, use a Word document or indeed any electronic resource, you can attach it to your lesson details for easy access once the lesson is under way. No more scrabbling around to find documents once lessons are under way. Ad hoc meetings, Parents’ Evenings, Away Days etc. These can all be added to your calendar on an as/when basis. Alternatively, if your school keeps whole school events such as Sports Day, Parents’ Evenings etc. in the MIS these can be added to your .csv and imported into Outlook. So what does Outlook Calendar look like? The image here (click to zoom) is a screenshot of my calendar for 25 & 26 September 2014. At the time of writing I haven’t yet planned the lessons so they appear dark green (my chosen colour code for unplanned lessons). You can also see that on Friday 26 September I have a PSHE morning which takes place at the same time as my teaching. Although I’m not involved in the PSHE event I find it useful to have selected other whole school events listed as they may have an impact on my lessons. CSV standards for ‘comma seperated values’ and if you were to open a .csv file it’ll open in Excel and look very much like an excel spreadsheet. Outlook can understand imported .csv files but not normal Excel files so it’s important that you save and import a .csv rather than a .xls (Excel) file. If you’d like to look at a sample CSV file you can download one I created by clicking here. A small box (caled the Import and Export Wizard) will appear. Click on Import from another program or file and then click Next. Click Browse and locate the .csv file that contains your timetable. Click on Calendar. If you’ve got several calendars listed (unlikely, but possible) make sure you click on the calendar which you use as your main calendar. Click Finish or, if you get a map custom fields option, just ignore it and click Finish. Your .csv file will now be imported into Outlook. Depending on the size of the .csv file and the speed of your internet connection this may take a few seconds to several minutes. If you do dump the teacher planner you may well be wondering where to put all of that valuable pupil tracking data e.g. results, MiDYiS, seating plans etc. Well, Outlook doesn’t quite offer space to do this but I keep all such data in an excel spreadsheet allowing me easy access to this information whenever and wherever I choose. How do I do that? That’s another blog post for another day. I used My Teacher Planner. It gives me both a printable version which I used to make quick notes in class (it is prepopulated with dates) it then also offers an Outlook version which is excellent. Over in Australia we use SEQTA, an online version of a Teacher Management System. It allows access from any internet connected device and allows students to see their scores and parents to see dates coming up. This is becoming more and more popular over here and around the world as more transparency is demanded by parents. It also allows for all forms to be completed by parents online, permission slips, Parents Evening requests etc. We also can use it to send an individual email to parents once a week with only the information they need for their daughter. It saves a lot of paper and only 5% of parents said they prefered paper. Many thanks for your comment Jennifer G. A printable version of a teachers planner (using Outlook or any such electronic calendar device) is most certainly very helpful. Indeed, on very busy days I do take advantage of the print function in Outlook. This allows me to see, at a glance, all of my lessons, meetings and activities alongside any notes I’ve made for that day. While I’m very keen for staff to utilise Outlook, or indeed any electronic calendar system, you make a very valid point that being able to print events (although I prefer on an ad hoc basis rather than every day) and use that printout to make further notes is very helpful. Although I’m not familiar with SEQTA many UK schools are also switching to transparent information, sent or accessed electronically, for parents and students. Several MIS suites used in the UK allow for this interactivity and I’m sure that in a few years it will become the norm. Parents have the right to demand up-to-date, valid and relevant information about their child when it is convenient and necessary. A good blog topic for a future date I feel!